Can you ever really know someone through just her blog? I mean, I’ve been blog friends with Dr. Bronwen Scott for years as the pseudonymous author of A Snail’s Eye View. Long have I enjoyed her clever observations of Australian avifauna, ecosystems, and, of course, mollusks. But, though I jumped at the chance to review her new book, Spineless, I was still unprepared for how good it really is. Guess I didn’t really know Bronwen after all! 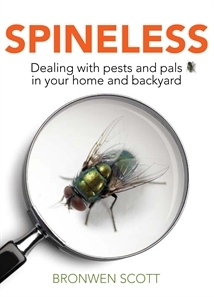 Spineless: Dealing with pests and pals in your home and backyard presents a plethora of useful insights about how to recognize and respond to the animals with and without backbones that share our homes and yards. This book is very well-written with a wry, conversational tone underscored by sound science. It’s also a lot of fun. Spineless is addressed to the author’s native Australia but pleasantly relevant to the rest of the world. Sure, you may not have to deal with leeches or cane toads on your particular patch (thankfully!) but odds are good that slugs, spiders, flies, and ants inhabit your garden wherever you live. The author, an invertebrate zoologist at Victoria University, Melbourne, has lots of tips for dealing with whatever critters come your way. Not only is this book accessible to laypeople, it has a style and tone that younger readers would love. Bronwen canvasses the full cornucopia of creepy crawlies Australia has to offer and still finds room to address the “other 5%,” vertebrates. Each organism is assessed on an easily understood “Pal or Pest” axis, one of many features that make this breezy book very user-friendly. I suspect, though, that it must have pained the author, given her nom de blog, to tar snails unequivocally as pests. Spineless is simply a wonderful book for anyone with even the slightest curiosity about the lives of everyday organisms overlap with ours. Dr. Scott offers not just insight but actionable advice. Before I received this book, I expected that any recommendation would be directed Down Under, in the geographical sense, but to be honest, I believe that readers in any country would be glad to have a copy of Spineless close at hand when encountering invasive invertebrates. I’m certainly glad to have mine! New Nature Carnival: House of Herps!